Shot in the face by a sniper while serving his second tour in the Iraq War, Dustin Kirby survived the attack, only to face a life trapped in pain. A decade later, Lenox Hill surgeons gave him a reason, and the ability, to smile again. On Christmas Day 2006, US Navy Corpsman Dustin Kirby was standing watch on the roof of an outpost in Iraq as the Marines in his unit called home for the holiday. After three quiet hours, it was his turn to call home. This was the small town Georgia boy’s second tour in Iraq and, by then, was known as “Doc.” The trauma medic for the Second Battalion, Eighth Marines had saved a lot of lives, including that of his friend and turret gunner Colin Smith. Like that October day, Doc’s medic skills saved another life on Dec. 25 – his own. The sniper shot ripped through his face, taking a chunk of his tongue and seven teeth with it, while destroying 13 centimeters of his jaw and causing a skull fracture on its way out. Doc would not return to the battle field. He required more than 30 surgeries to repair all of the damage and, still, he was left with chronic pain for the next 10 years. “It hurts to talk. It hurts to eat. It hurts to even look around sometimes,” Doc said. No service member in our communities should feel forgotten or left behind. 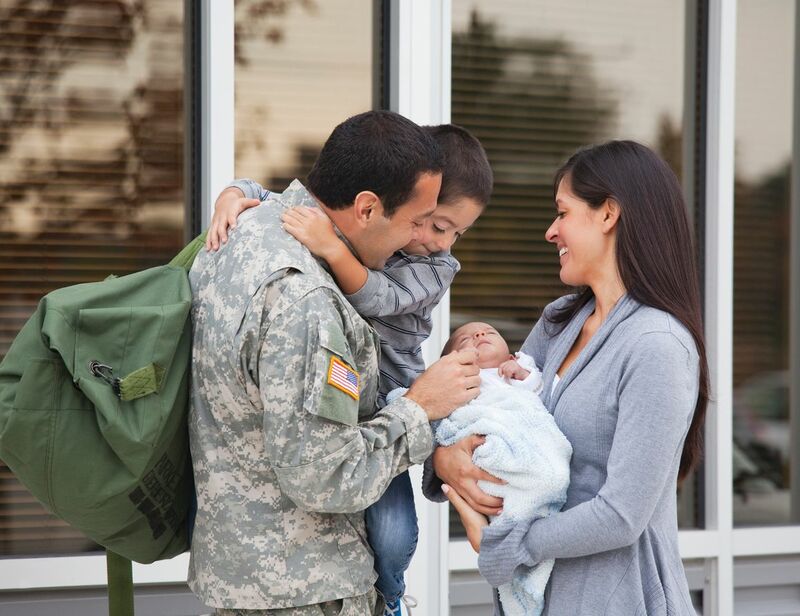 We're committed to bringing high quality care and services to military members, veterans and their families. Doc grew tired of surgeries, tired of doctors and, eventually, tired of trying. He used alcohol to cope with the pain from his injuries and post-traumatic stress disorder (PTSD). He put on weight and grew a beard to hide the scars on his jaw. His teeth were deteriorating and, coming up on a decade after he was shot, the metal plates that held his reconstructed jaw in place were failing. Mrs. Kirby hadn’t seen Doc smile in nearly 10 years. What she did see was a man, her oldest child disfigured from war nearing the end of his rope. She reached out for help. With the support of an entire community – both at home and among veterans – she was connected with a team of doctors, led by David Hirsch, MD, director of maxillofacial surgery at Lenox Hill Hospital. The pioneer in virtual surgical planning came up with a plan to ease Doc’s decade-long pain and give him a new set of teeth. “I removed all the old hardware after the 30 surgeries that was in there and then we added new hardware to keep the bones together and allow them to heal after they were surgically broken,” said Dr. Hirsch, who performed two surgeries pro-bono. The new hardware was a custom-fitted titanium plate, which Dr. Hirsch added after repositioning Doc’s mandible bone to better align with his teeth. By moving it forward, up and to the right, Kirby would now be able to talk, eat and, yes, finally smile with no pain. Mrs. Kirby, who had fought, as her son would say, like a bulldog to get Doc this far, waited in the hospital with family, friends and tempered excitement for some good news that day. “It went good?” she asked the doctor. “It’s exactly the outcome we wanted,” Dr. Hirsch replied, seconds before a Kirby family friend placed an American flag scarf, matching her own, around his neck. The Kirby family had a lot to smile about that day and in the months to come. But, Mrs. Kirby still hadn’t seen her son “completely smile.” That would happen on Sept. 14. 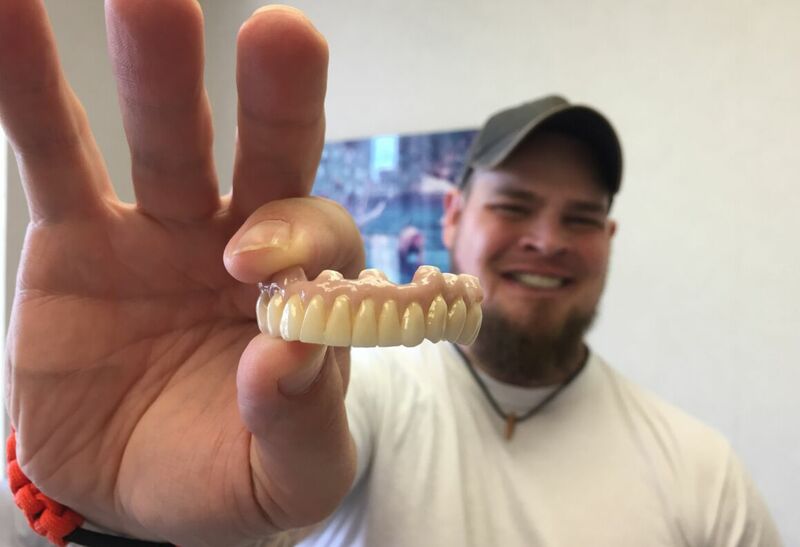 “They removed all my old teeth and then they spent all day making me a wonderful set of teeth,” Doc said. Two days prior, Dr. Hirsch put in dental implants in the jaw to act as the “root of the tooth.” Then, on Sept. 14 a team of dentists fashioned a set of teeth – although a temporary set – that would attach to those implants. They will build a second temporary set before the final porcelain set is made. Like everyone that met Doc after his injury, his daughters had never seen him really smile. So, when he returned home, he drove straight from Atlanta airport to their elementary school to surprise them. The Kirby kids had many more firsts when they joined their dad on another trip to New York City in December. But, this time it was not for a surgery or an appointment. “We brought Dusty and his four daughters to New York so that they can experience Christmas in New York, and try to bring his Christmas spirit back to life,” said Juan Serrano, US Marine Corps veteran and director of Military and Veteran Liaison Services for Northwell Health. Christmas is a hard day for Doc, especially on the tenth anniversary of his injury. The memories, he says, will never go away. But, watching his daughters take their first plane ride, see Rockefeller Center, the Rockettes Christmas Spectacular and a world of new experiences this year made it easy to smile and mean it. Now Dusty is looking forward to taking family photos and actually smiling in them. "I couldn’t imagine a life without pain, and here I am. I couldn’t imagine a life with teeth and, ya know, here I am. And I can’t imagine it being better than it is right now. "